Materials:Mineral powder, metal powder, coal powder, coke powder, iron, ore, iron oxide, slag, refractory and other materials. Application:Mineral powder briquette machine has found wide application in coal industry, metallurgy industry, chemical industry, etc. Mineral powder briquetting machine is mainly used for pressing non-ferrous and ferrous metal powder such as iron, phosphate rock powder, nickel powder, nickel laterite ore, fluorite powder, aluminum powder, oxide skin, slag, iron powder, aluminum ash, silicon manganese ore, etc. Due to the different processed materials, mineral powder briquetting machine is also called phosphate ore powder briquetting machine, nickel ore powder briquetting machine, laterite-nickel ore briquetting machine, etc. 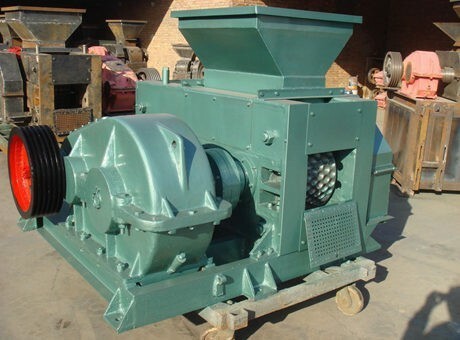 Through years of industrial use and improvement, mineral powder briquetting machine has debugging advantages of high briquetting rate, small power consumption, compact structure and convenient maintenance when compared with other similar products. Our mineral powder briquetting machine is proud of that the finished briquettes come with high intensity, great convenience for transportation and various shapes. Custom-made shape is also available. 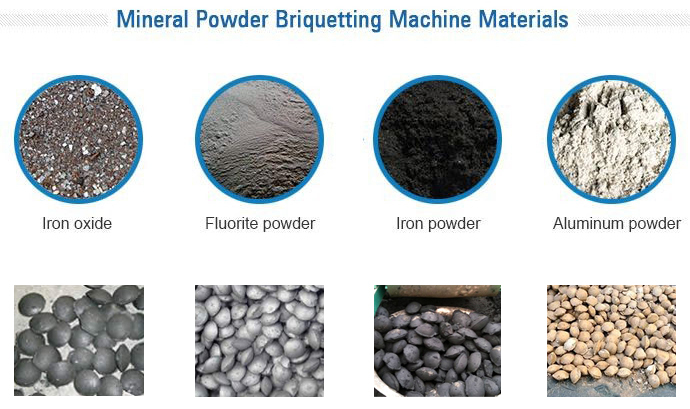 Additionally, the briquettes made by this nonferrous metal powder forming equipment can be used in blast furnace process and metal smelting as chemical and smelting auxiliary material. Since that, this mineral powder briquette machine has found wide application in coal industry, metallurgy industry, chemical industry, etc. To be specific, the steel plants can supply mill scale briquettes made using this briquetting equipment to chemical plants for manufacturing ferrosilicon. Aluminum briquettes can be put into smelting furnace for extracting aluminum. Fluorite briquettes can be used as cosolvent for making steel. 1. Feeding part: ensures that uniform materials enter into the double roll by quantitative feeding. 2. Transmission part: main transmission system is motor - triangle belt - reducer - open gear - roll. 3. Forming part: mainly refers to the main part, the core part is roller. 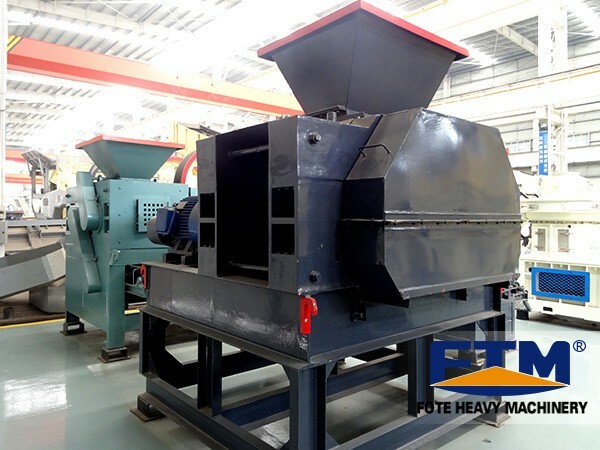 Fote Machinery is a modern high-tech enterprise which mainly produces large, medium and small briquetting machines, such as mineral powder briquetting machine, fluorite powder briquetting machine, dry powder briquetting machine, strong pressure briquetting machine, desulfurization gypsum briquetting machine and the accessory equipment of briquetting machines. Our products have passed the IS09001:2000 international quality system certification, which successfully enter into the international market. If you need more details about briquetting machine price, please send mails to info@sinoftm.com or click our online customer service!